Red Clay Blood I was born and raised in Oklahoma. Although it's hard to tell. I'm mostly city, with just enough country to keep myself sane. I've seen Oklahoma grow over the past few years, happy it's growing, not for the what it seems to be growing into. I'm looking for my reason to be here and to remain here. Does sollex1988 belong in this group? Love the feeling of a round soft women. Love the feeling of a round soft women. Looking for long term relationship with someone who is inquisitive and openminded spiritualy. I am very interested in metaphysics. I don't do much cooking, but love home cooked meals(the way to a man's heart is through his stomach). I love to touch(I'm kinesthetic). Does toolman51000 belong in this group? Does bigmike2u belong in this group? I'm an Okie!!! 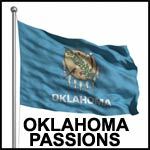 Oklahoma is my home because this is where ll my family and friends re!!! Does ktdid352 belong in this group? Okla semi- nerd looking for female playmate.. I have lived all over the USA in my short life on this dirtball but Okla always seems to call me back for some reason... I guess it's home. The only games I love to play are table top and/or on a screen... let's do it! Does gjinja belong in this group? Looking for like-mindedness Simply looking for someone to converse with and possibly get coffee with or hang out and go to local establishments and events. Does pir8fan76 belong in this group?